Fitbod solves the internal trigger of uncertainty with one tap, telling the user exactly what to do next. While disheartening, the figure is not surprising. Humans are hardwired to value short-term rewards over long-term benefits. We often choose to stay under warm bed covers rather than invest in the future benefits of working out. I know that dichotomy all too well. I’ve struggled with working out for as long as I can remember. I aired many of my gripes in my previous article on why “Your Fitness App is Making You Fat,” but the frustration goes back much farther. As an obese child, my mother dragged me to the gym to help me slim down. As a lethargic teenager, I joined the high school wrestling team in a desperate attempt to get in shape, but I never won a single match. As an adult, I tried to prioritize the gym as part of my regular routine countless times but failed at each attempt. Fitbod is a beautifully designed app that has helped me consistently hit the gym for over two years, and I’m not the only one who’s found the app helpful. Over three million people have downloaded Fitbod, and it’s consistently ranked among the top-grossing and top-rated apps in its Apple App Store category. While the app has been incredibly useful to me, I was pleasantly surprised to learn that my book, Hooked, was useful to the app’s founders. In 2015, Chen says he read Hooked and designed an initial prototype based on the four parts of the Hooked Model. He started with the internal trigger, the actuator of the behavior, which he identified as the uncertainty of not knowing what to do in the gym. Once Chen had a working prototype, he shared it with his college friend, Jesse Venticinque, who was working as a designer at LinkedIn at the time. “I read Hooked when it made the rounds in the office,” Venticinque told me. Seeing the potential to build healthy habits in people’s lives, the two joined forces and moved forward with the project. Together, Chen and Venticinque began refining their app to help users build a habit of using Fitbod in the gym. 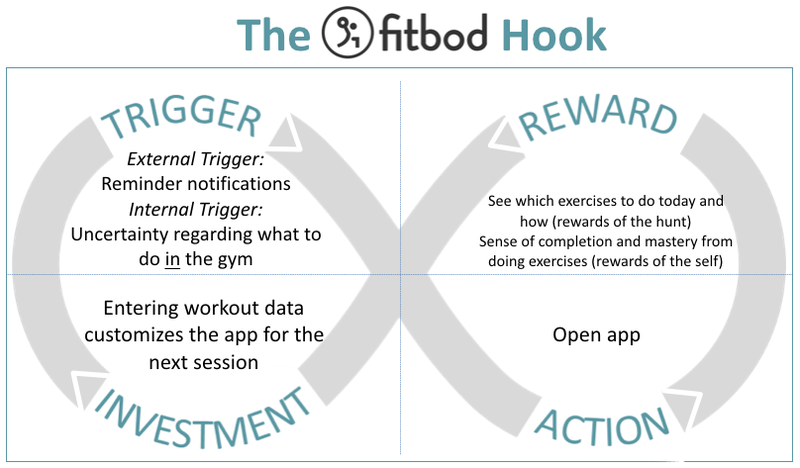 Here’s their Hooked Model: After identifying the first step of their hook, the internal trigger of uncertainty, Chen and Venticinque needed to ensure Fitbod’s Action Phase would quickly solve the user’s psychological need by providing certainty about what they should do in the gym. I acutely remember the embarrassing feeling of standing around in the gym, not knowing what to do, and feeling I was probably in someone’s way. With Fitbod, simply opening the app provides quick relief. With one tap on the app, Fitbod creates my next workout, removing the discomfort of uncertainty by quickly telling me which exercises to do, in what order, how much weight to lift, how many repetitions to do, and even how long to rest between sets. I don’t have to think about anything. I just have to do what Fitbod tells me to do. “The simplicity of a single, ‘next workout to do’ really helps the gym-goer quickly solve their psychological uncertainty,” Venticinque told me. 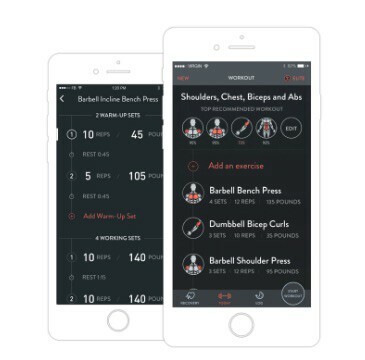 By generating the workout program on the fly, Fitbod overcomes some of the stumbling blocks associated with other fitness programs. For instance, whereas most of Fitbod’s competitors ask users to embark on a lengthy multi-week program, Fitbod requires no long-term commitments. Similarly, if users fall off track, they can easily get back on track because the app is always ready with their next best workout. Next, comes the Variable Reward Phase of Fitbod’s Hooked Model. Not only is there an element of surprise in discovering which exercises the app chooses for me (rewards of the hunt), but the app also brings out the intrinsically rewarding elements of exercise as well. Unlike other fitness apps that reward users with corny badges or points, which can become less motivating over time, the main reward when using Fitbod is the satisfaction of conquering the exercise itself. By giving users clear weight and repetition goals for each activity, Fitbod harnesses the search for mastery and competence endemic to “rewards of the self.” There’s variability in seeing if you can smash your personal best. And Fitbod helps by setting achievable, incremental goals with each exercise. Finally, Fitbod gets smarter with use, a characteristic of well-designed, habit-forming products. The Investment Phase of Fitbod’s Hooked Model occurs every time I log an exercise. By entering data, I’m storing value in the service and ensuring it improves the more I use it. With my previous exercise information, the app tailors future sessions and recommendations. I can also invest more value in the app by tailoring my fitness goals, available equipment, and even how much time I have to workout — all factors the app uses to compute my next tailored workout. Fitbod isn’t free. Users pay a monthly or annual subscription. But unlike gym memberships, which most people abandon despite continuing to pay dues, the Fitbod founders tell me their app loses very few customers and is used on average nine times per month per user. Fitbod’s application of the Hooked Model is clearly working. The founders tell me its user base and profits continue to grow. As someone who has always struggled with inconsistent exercising habits, I’m proud to say that I’ve formed an indispensable habit with Fitbod. I’m happy to let the app do the thinking for me so I can focus on my workout. Instead of relying on an expensive personal trainer or spending countless hours reading fitness books and logging exercises with clunky pen and paper, I’ve finally built a helpful and healthy habit.